"..playing with a torrential passion that was an immediate reminder of the virtues of seasoned musicianship. Three more experienced and insightful players it would be hard to find." Moray Welsh has an extensive recital and concerto repertoire and can be heard in recital with Martin Roscoe and Jonathan Papp. 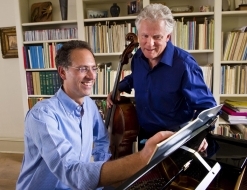 Other duo partners have included Simon Rattle, Roger Vignoles, Anthony Goldstone, Julian Jacobson and John York. He also works regularly with violinist Marcia Crayford, Simon Rowland-Jones, viola, and the Fitzwilliam Quartet. From 2005 to 2016 he was also a member of the Cropper Roscoe Welsh piano trio which performed extensively throughout the UK. Amongst London engagements were a complete Beethoven Piano Trio Cycle at Kings Place.